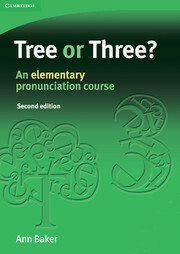 Now in full colour and with updated artwork, this revised edition of the classic pronunciation title, Tree or Three?, retains its simplicity and straightforward syllabus. The maintained emphasis on minimal pairs, which made the original edition so popular, makes pronunciation practice light-hearted and accessible. Each unit offers comprehensive practice of sounds, with additional work on stress and intonation, and the accompanying audio CDs give lots of listening and pronunciation practice. Still ideal for classroom use, the new edition is also more suitable for learners working on their own (at home or in self-access centres): clearer rubrics for exercises have been included together with better overall navigation and a clear answer key. The book is available in a pack (comprising book and 3 audio CDs) for self-study, or separately for classroom use. EASY TO USE: Full teaching rubrics allow the material to be used both for self-study and classroom use. Stand-alone units allow you to focus on sounds which you find difficult. SYSTEMATIC: Each unit offers comprehensive practice of sounds, with additional work on stress and intonation. MORE AUDIO: Three audio CDs give lots of listening and pronunciation practice. FULL COLOUR: Attractive full-colour artwork aids understanding and makes the material memorable. EXTRA WEB SUPPORT: Visit www.cambridge.org/elt/shiporsheep for extra practice and support. Get an eSample of Tree or Three? that will allow you to view a product preview on your desktop.